Marketed as a tower defense plus role playing, my impression is that it doesn't fit the mold of either a tower defense or role playing game. Sure you can upgrade towers and train a hero, but the towers lack strategic placement and the hero can only cast spells. Grow Empire has very similar game mechanic compared to Grow Castle (click for review) which I find to be addicting. 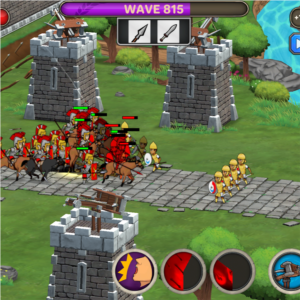 With a simple to learn gameplay of defeating the onslaught of the enemy before they destroy your wall and defenses. One of the reasons I ended up playing such a similar game is Grow Empire Rome is also sold as a game with unlimited waves. However, note that although there are unlimited waves, your units do max out on upgrades, which will eventually max out your wins. Since I had previous experience with Grow Castle, I find that having a simple strategy of only upgrading one unit is the most effective way to win. This way, you don't have to match your units with the enemy units. Instead, your fully upgraded units are always better than what the enemy sends. Generally, I upgrade the strongest unit the swordsmen, which as no advantage and no weakness. Additionally, I like to make upgrades that increase my earning potential per wave. There are certain hero upgrades that give you more coins per kill. There is also the ability to upgrade the bank that gathers coins from your conquered colonies when offline, essentially free coins with zero effort! Conquer more colonies to increase that income. For me, I reached Wave 815. I spent hours playing, often times when I had nothing better to do such as waiting at the airport or on a plane. At that point, the game is pretty much over. Overall, I do regret playing the game, but it was successful at killing time that I would otherwise be bored.